Nothing gets you ready for a zombie apocalypse quite like singing in a karaoke bar. Yakuza of the End is due to be released in Japan come March 17th, but fans of Sega's Yakuza franchise are in for a treat in the near future. Sega has announced that it'll be placing some of the game's music in karaoke halls via Joysound and UGA. Four songs are scheduled to be featured, and the accompanying videos will show game characters performing the music. Kazuma Kiryu (the series' protagonist) will sing "Kamuro Setsugekka" and "MachineGun Kiss." Haruka Sawamura will appear when someone sings "Kitto Change Myself" and "Otomeiro My Life." Finally, both characters will appear together during "Kamuro Setsugekka" and "Kitto Change Myself." 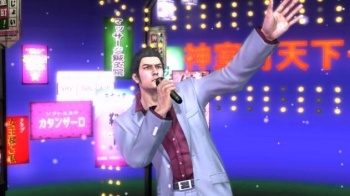 This isn't the first time Sega's used karaoke to promote its Yakuza games. From what Eurogamer says, it actually seems like a fairly regular occurrence. I'm actually a little bummed that the company isn't holding promotional events like this here in the U.S. I would totally sing karaoke songs from a game all about killing zombies.